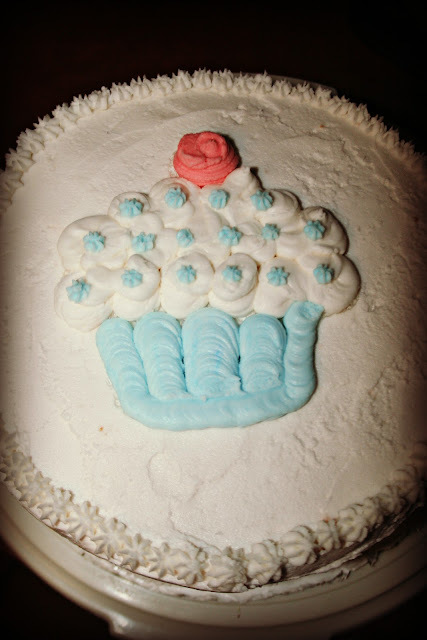 I've wanted to take a cake decorating class for a while now, but resisted because...well....it just seemed so domestic. But finally I decided to jump in and see how it went. I really hated the first class and felt restless because all we really learned how to do was make the buttercream icing in different consistencies, fill a pastry bag with it, and make stars. I was bored. But something happened in the second class and I started to enjoy myself more. The course ran for four classes, and I took pictures of my creations for the last three classes. Keep in mind that I am very much a newbie and need more practice! The first cake I made was a two layer white cake with my homemade wineberry jam between the layers. I took it to my grandmother's house. Everyone thought it was quite tasty. 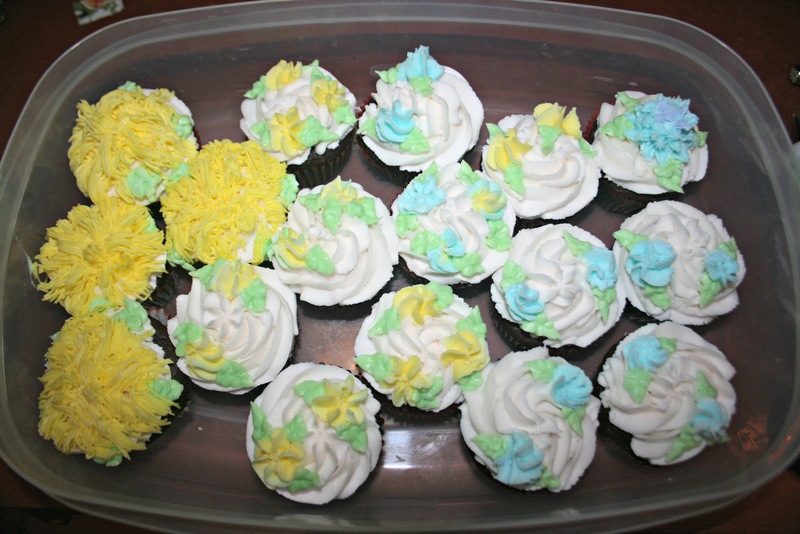 The third class I made chocolate cupcakes with the buttercream frosting, filled with vanilla pudding. I learned how to make little flowers, leaves, and the shaggy mum technique. 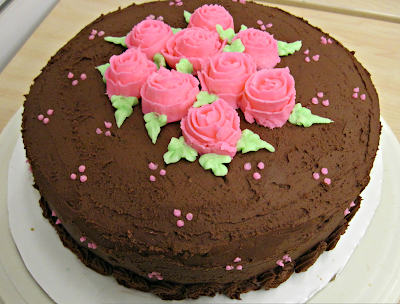 In the final class I did two layers of white cake with my homemade strawberry jam in between, a chocolate buttercream frosting, and a bunch of roses. I stuck this cake straight in the deep freezer, as I am all junk-fooded out from the holidays. It'll be a nice treat later this winter. Classes were on sale last week for just $5 a piece, so I went ahead and signed up for the second level of cake decorating. How about you, readers? Have you ever signed up for a class just for fun? I have wanted to take a cake decorating class as well! My mom used to make all of her own cakes and had all of the little attachments to make stuff, but she got rid of it, and now I am trying to figure out if I will go for it or not. Yes, I took one, it was fun. You are only limited by your imagination! I make a cake for Daddy and Mama every year, once Daddy's cake was an old tractor. I used a rectangle pan for the body, a large round pan for the back tire and a small cake pan for the front tire. The icing was of course bright green, Daddy's favorite tractor! The model number was his age. I have made cakes with fields on them, using cocoa for the "dirt" and toy tractors on top. I drew one of his old trucks on a cake once and the icing was the color of his truck. My daughter liked smiley faces when she was a teen, those were easy to do. I have used cookie cutters to press an image onto the cake and filled the design in with icing stars. I am by NO means professional, but I have fun with it and try to let my imagination make up for the fact that I only took one course. Would love to take more, but they are not available here. Just have fun with it and let your imagination take over. Your loved ones will appreciate the fact that you made them a special cake, even if it is not perfect. Hope that you have lots of fun!!! Organized storage can be an issue. The longer you do this, the more you accumulate. I store icing colors in an egg carton. If the color spills or leaks, the mess is in the egg carton. The other things are stored in clear plastic dollar store shoe boxes. I look for intersting pans at estate sales, and have found some icing tips and a couple of books at a moving sale. Just keep your eyes open and you will find some goodies!! I took one knitting class and enjoyed it but I didn't take anymore after that. Now, I've forgotten how to purl. One day I hope to take a few more knitting classes and possibly an intermediate sewing class or two. I would LOVE to sign up for a water colors class .... but alas I'm too much of a chicken to do it. The last cake is a masterpiece! I don't do classes -- mostly a DIY kinda gal -- enjoy that cake whenever! How fun and a great skill to have with three growing boys! Enjoy the weekend. Well done Lisa. I can't remember the last class that I took; which likely means I am missing out and due for one. When I was a consultant, I worked with an elderly couple who had retired, got bored, and decided to open a bakery in their tiny little town. The business was just breaking even until the very talented lady started offering cake decorating classes--people started traveling from all around to work with her. You did a great job! All the work looks really good. When I was a teenager, my mother and sister-in-law took a cake decorating class, and I loved eating their samples! My sister-in-law ended up doing wedding cakes. I've no desire--but you sure did lovely work! My mom took a class years ago when I was in high school. We ate LOTS of cakes then. You did an awesome job on them. We have junked out here too. We need to snack on veggies for awhile. very cool! congrats on fulfilling a goal! Lisa! Look at you, Miss cake decorator. Great talent! Now lets have some cake! These are gorgeous, you were a good student! I never thought pink would look good on chocolate, but it is really pretty. The first cake is also adorable! It would be perfect for a baby shower. The cakes look great! My kids still laugh about the "Mom" cakes they got for their birthdays - needless to say they tasted better than they looked! You are doing great, Lisa. Glad you enjoy it and are doing so well with it. Love the roses in the last cake. Awesome!!!! I don't do classes anymore --but they offer tons of them for retirees in our area IF I ever get bored and want to participate. They all look great, but I love the last one with the roses! It is so beautifully done. Great job! Wow! Great roses. You cakes look nice. I love cake decorating. I am self taught from youtube. I have always wanted to take a class. Hope you have a great weekend. I was going to with my sister. That was before she had Emerson. She stopped working and practically doesn't go any where any more. well done, they look very good! Beautifully done Lisa! I used to be a professional cake decorator and baker, oh the stories I could tell! I've been wanting to take a local Chinese cooking class but will have to wait until a vehicle is available. I haven't signed up for any fun classes but I think I should. You did a great job on these and those roses are beautiful! I think your roses look pretty darn good for a newbie!! So pretty and very impressive! I can't wait to see the next batch. Oh my goodness I think your cakes were lovely - great job. And I I would love to take a cake decorating class. I think it would be fun. Good idea. I couldn't get past wineberry jam. That sounds yummy! I think these are awesome and I admire you for doing something you ordinarily wouldn't do! You did a gorgeous job decorating. These are beautiful! My daughter has done cakes for her three girls over the years and they are always so thrilled. I am still hung up on the wine-berry jam in between the layers. Good gosh that sounds yummy! Wow, Lisa!! Those are impressive! Oh my gosh Lisa!! You did fantastic.... Wow!!! oh lisa, i would love to do that!! sounds fun and the cakes look amazing!! i have wanted to take pottery classes forever and i just don't do it!! i always think, you have a gazillion projects you haven't finished and that need to be done, so i refrain, with much regret!! Those look great! $5 ??? That's an awesome deal. I have and I love to do stuff like that. :> I miss it, in fact; need to get back in gear. In answer to your question about memory storage for pictures. If you go into your picasa (where your blog pictures will be stored) and scroll to the bottom of the page you will see the percentage of storage you have used. I had to resize my pictures to 800x600 to get by storage percentage down. I my rural area, nothing is offered. Are there any classes you can take after this one? I always wondered if they have levels of classes on this kind of thing or not. I'd like to take one one fondant. I've never used the stuff before. Most of them are blah tasting. My sister has a pretty good recipe that doesn't taste too bad. You are doing so well at it, that you could sell wedding cakes. Dang are you good. My mommy decorated a doggy bone once. They look so Yummy! You have such a great talent! Good for you, Lisa. You are always doing something, and I am always amazed at everything with those precious busy little bodies. I think you're doing really well, and looking forward to how you continue. Love your decorating. It all looks yummy!